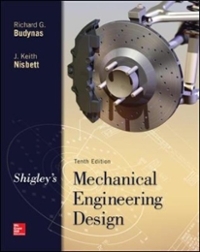 Shigley's Mechanical Engineering Design 10 Edition Shigley's Mechanical Engineering Design is intended for students beginning the study of mechanical engineering design. Students will find that the text inherently directs them into familiarity with both the basics of design decisions and the standards of industrial components. It combines the straightforward focus on fundamentals that instructors have come to expect, with a modern emphasis on design and new applications. The tenth edition maintains the well-designed approach that has made this book the standard in machine design for nearly 50 years.McGraw-Hill is also proud to offer Connect with the tenth edition of Shigley's Mechanical Engineering Design. This innovative and powerful new system helps your students learn more efficiently and gives you the ability to assign homework problems simply and easily. Problems are graded automatically, and the results are recorded immediately. Track individual student performance - by question, assignment, or in relation to the class overall with detailed grade reports. ConnectPlus provides students with all the advantages of Connect, plus 24/7 access to an eBook.Shigley's Mechanical Engineering Design. includes the power of McGraw-Hill's LearnSmart--a proven adaptive learning system that helps students learn faster, study more efficiently, and retain more knowledge through a series of adaptive questions. This innovative study tool pinpoints concepts the student does not understand and maps out a personalized plan for success.